Technically, a staycation is a vacation without leaving the home; it's where the family engages in activities within their residence or somewhere near, yet still sleeping in their own beds at night. Our experience last weekend was more of a "nearcation", which is a vacation without the long drive and/or air travel. The former term is more commonly used locally though, so we'll just stick with that. 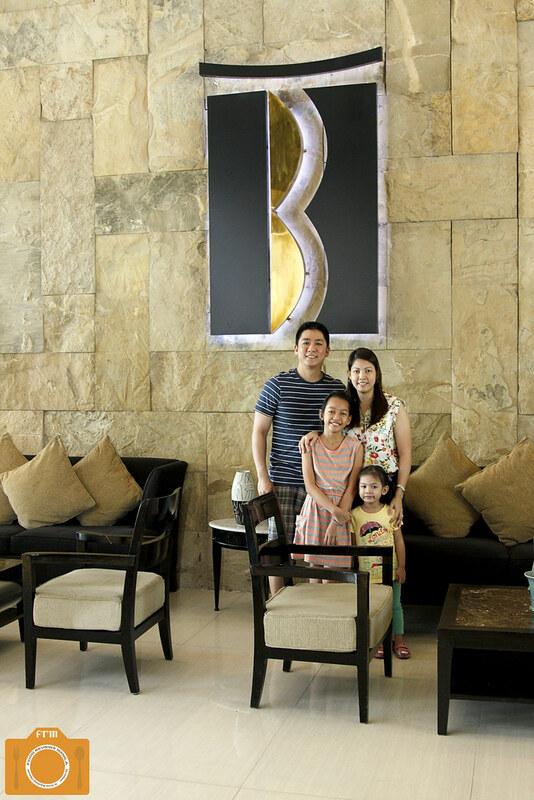 We were invited for a 3-day / 2-night family staycation at the B Hotel in Alabang. Naturally, we were excited. It was a much needed getaway from all the stress and brouhaha of everyday life. 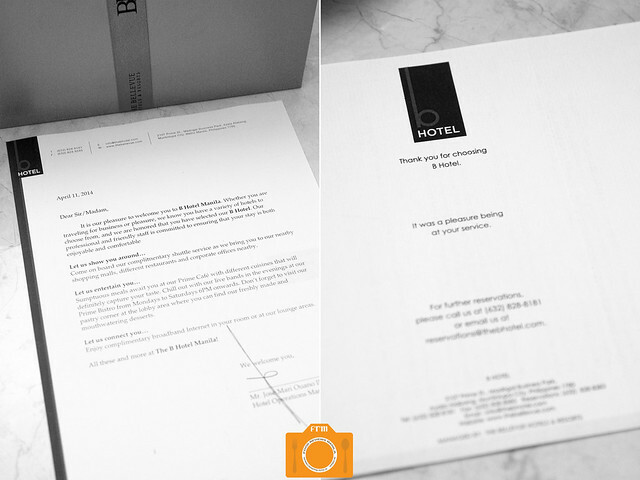 The B Hotel---a sister hotel of The Bellevue Manila---is actually a business hotel with the aim of bringing pleasure into the equation. As much as they provide necessities for businessmen such as high-speed Internet access and long distance telephone services, they also believe that pampering is the new business amenity. 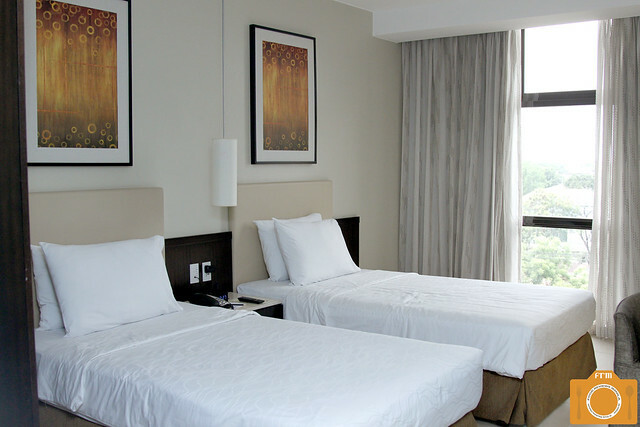 This hotel is located at the heart of Muntinlupa's business district and about 20 minutes away from the international airport via Skyway, so it's really an ideal place to stay for travelers doing business in the South. 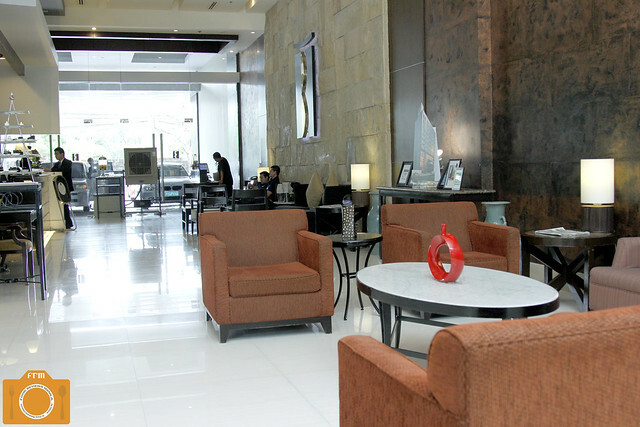 Its value-for-money accommodations don't hurt either. 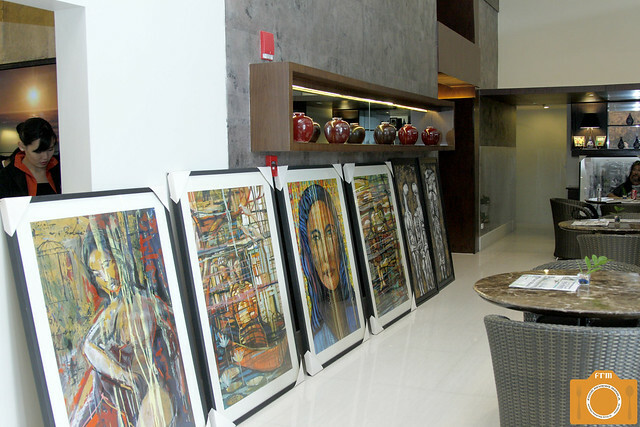 Aside from that, it is walking distance to Alabang Town Center and Molito Commercial and Dining Complex, although they have a daily shuttle service that can take you to nearby Alabang malls, restaurants and corporate offices. The shuttle leaves every hour on the hour, and you can call the reception desk if you're ready to be picked up from your location. 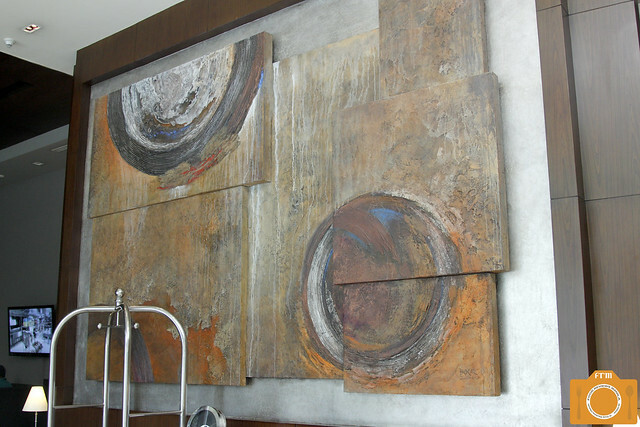 When you enter the hotel, the first thing to greet you is this gigantic painting. To the left is the hotel's resident restaurant, Prime Café. 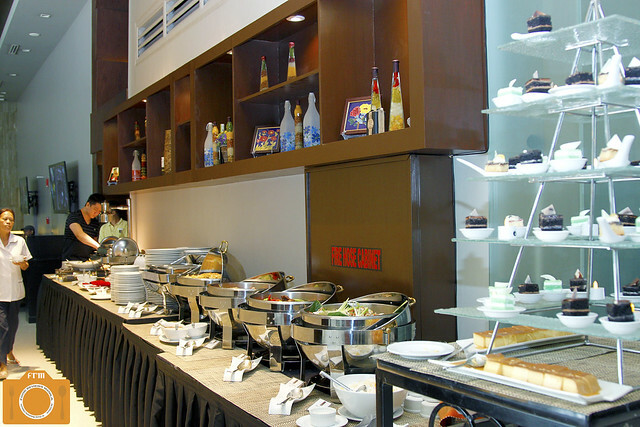 Here is where you have your complimentary breakfast buffet for two that comes with your overnight stay. From Mondays to Saturdays, 6PM onwards, this turns into Prime Bistro where diners are entertained with live bands, perfect for chilling out. Where's the food, you ask? It's right behind the aforementioned painting's wall. 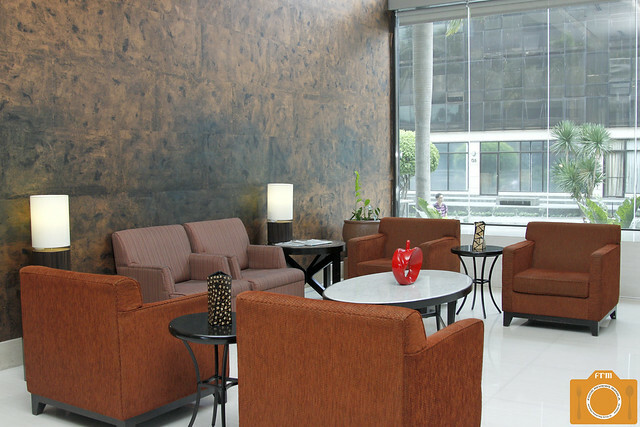 To the right is the hotel lobby, where various lounge chairs are available as you wait or while away the time. 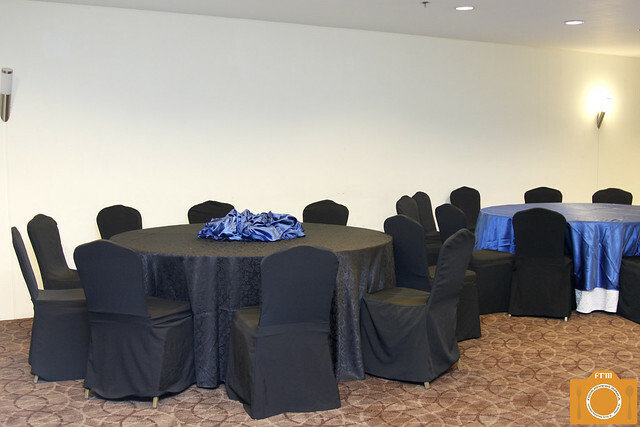 Business jetsetters could also meet up with colleagues here. Toward the back is the reception area. There are welcome drinks by the back door which leads out to a parking lot. There is a basement parking for overnight guests, free of charge. Check-in is at 2 PM, while check-out is at 12 NN the following day. 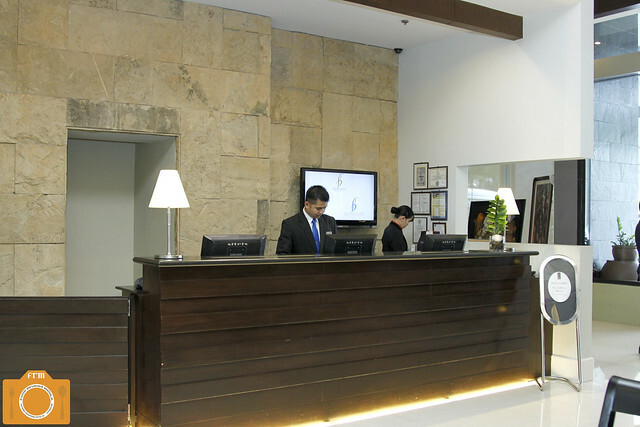 The reception staff has a ready smile for you, and are very accommodating at answering every query you may have regarding your stay. 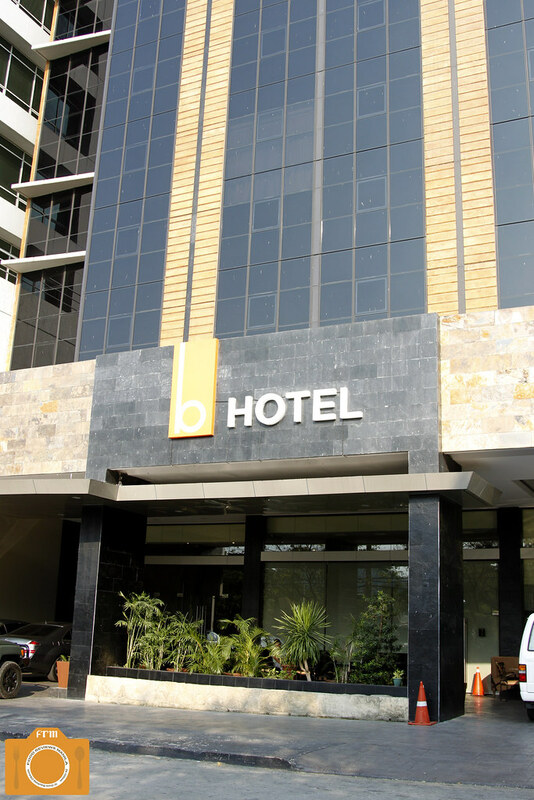 What is a business hotel without a function room, and B Hotel has one that has a capacity of 80 to 100 guests. 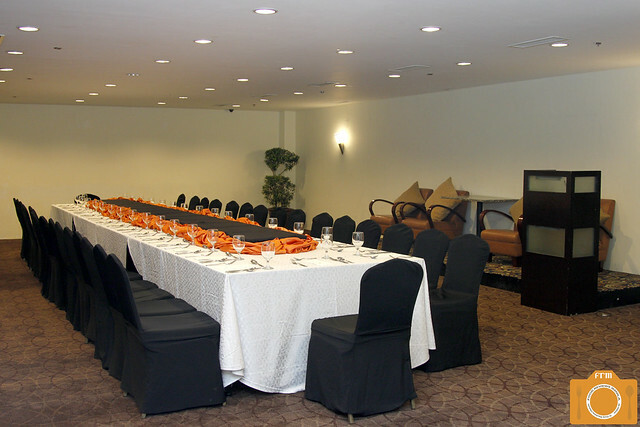 You can use it for business meetings (it is Wi-fi ready) and even social events like baptism or wedding. There's even a podium and seats for speakers if you need them. Aside from the function room, B Hotel has a mini gym housed in one of the rooms, so it may not be available at times, especially when the hotel is fully booked. 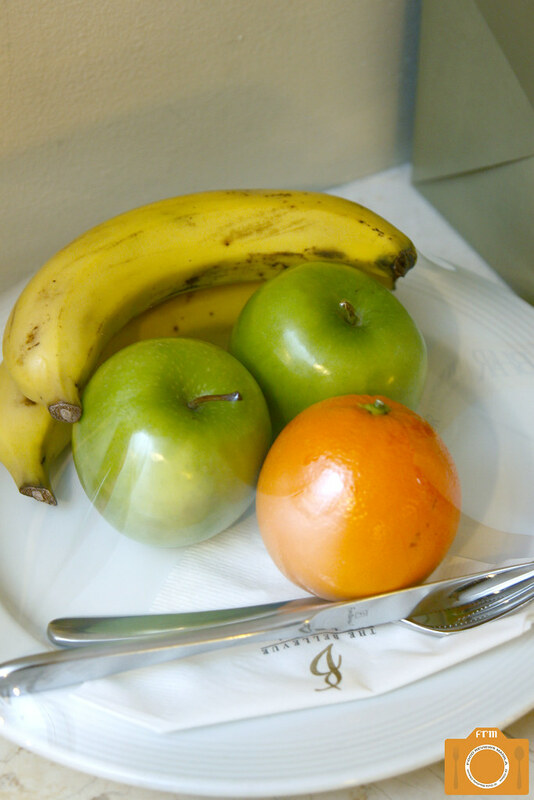 They also have an in-room relaxing massage service, which is P900 nett an hour. 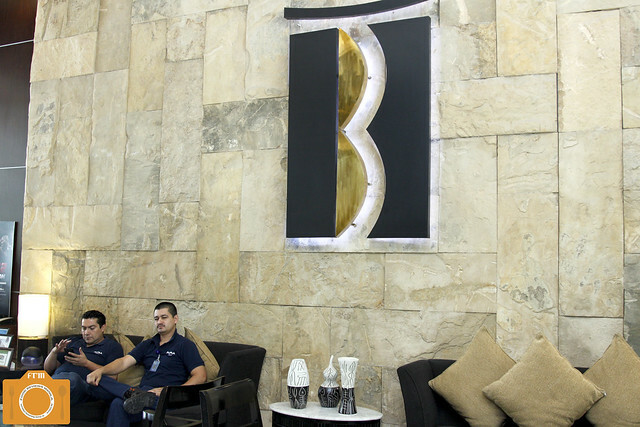 The B Hotel has a total of 152 rooms -- 90 standard king, 54 standard twin, and 8 penthouse suites. 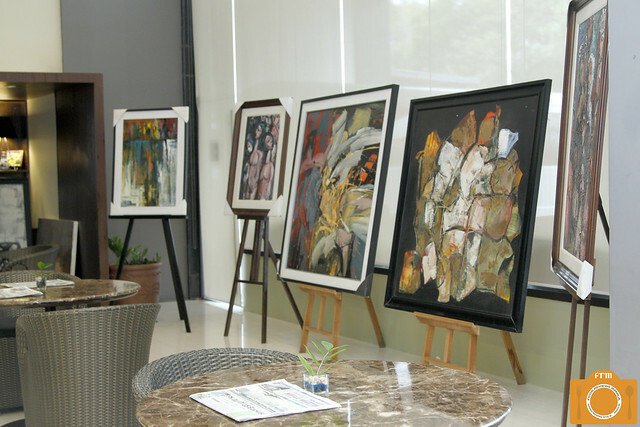 The penthouse suites are all situated on the 12th floor (top floor) with a beautiful view of the Alabang business district skyline. 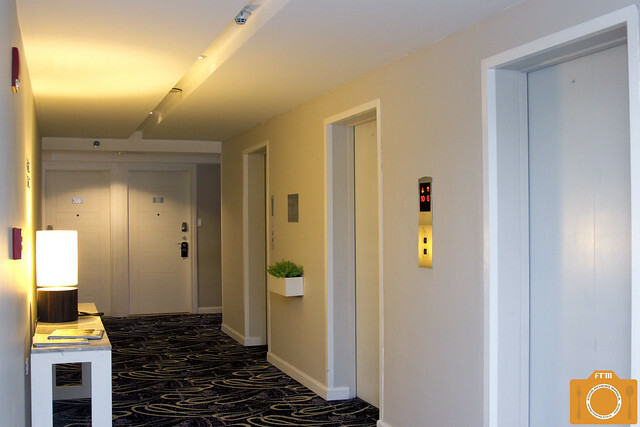 All standard rooms are on the other levels; they don't have a 4th floor. 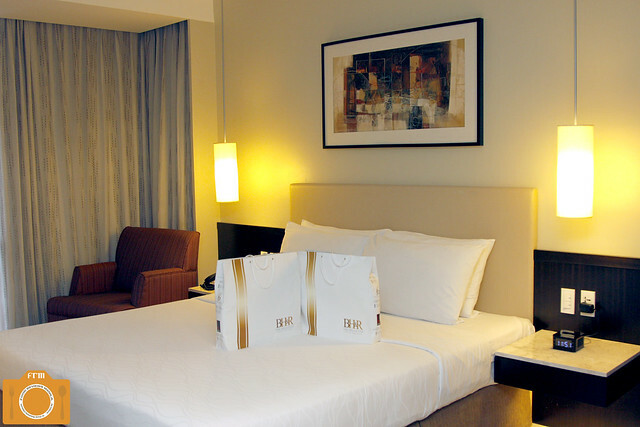 They have a promo for this month of April wherein the Standard Room is only P3,500 nett per night. 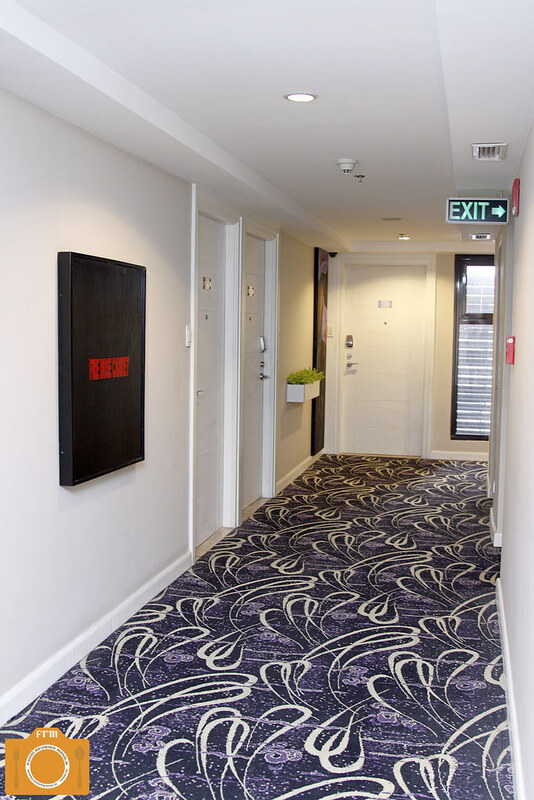 All rooms are equipped with energy saving power-controlled switches, so don't forget to remove your room key card from its slot by the door when you leave, so that it automatically shuts off the room's power supply to conserve energy. ...while the kids get to stay in the room with the double beds. There's a connecting door between the two rooms so it's perfect for families. Who says this is just for business?! There's a floor-to-ceiling picture window that brightens up the rooms, though there are drapes if you prefer a dim atmosphere. The beds are so inviting, and the pillows just cradle your head into dreamland. It made it so hard for us to get up every morning; we just wanted to stay in. If you need more pillows or blankets, you can request for more; they'd happily oblige to provide whatever you need. 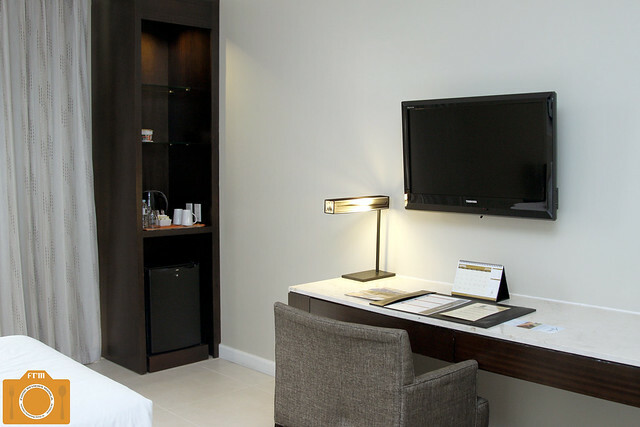 Both rooms have their own flat screen TVs mounted on the wall. Beneath is a desk where you can set up your laptops and documents. There's free wired and wireless internet connection in all rooms, the password is in a small piece of paper tucked together with your key card. 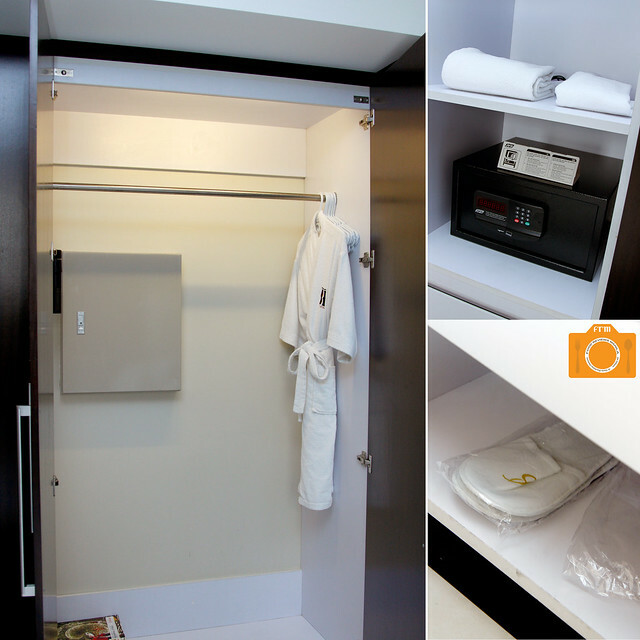 The closet has a set of phone directories, a bath robe, and a large space for hanging suits, dress shirts, and dresses. A smaller adjacent closet has shelves with towels, a hairdryer, a vault, and two pairs of bedroom slippers that's about size 10 in men's sizes. 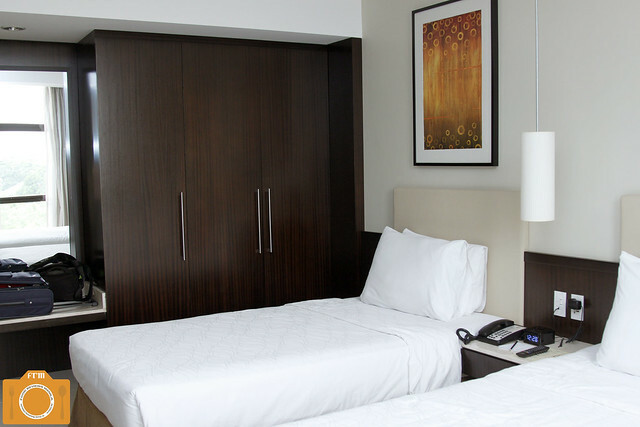 The drawers also have laundry bags if you need to avail their 24-hour laundry services. There's the usual phone, pad, and pencil, as well as an alarm clock and channel guide. 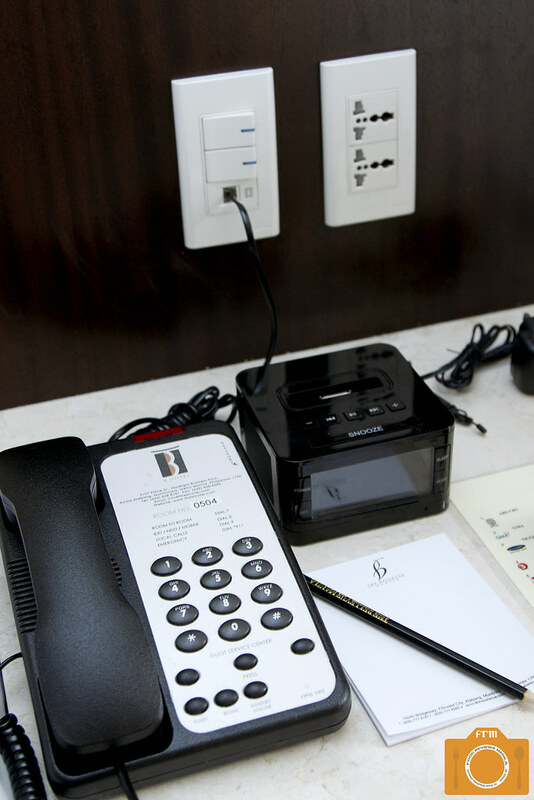 Outlets for universal adaptors are aplenty---by the bedside table, at the side of the desk, in the bathroom, at the mini bar---useful for whatever plugs your gadgets have. 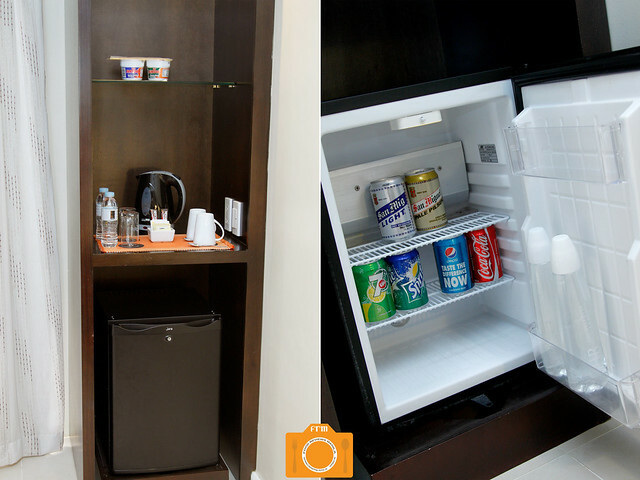 There is a mini bar with complimentary water bottles and coffee, which are replenished daily. However, the beer, sodas and cup noodles will be charged to your account if you consume them. The refrigerator is small but it can hold a few more items. 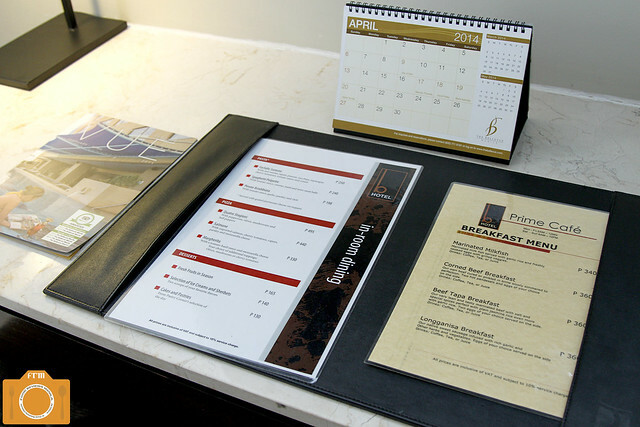 There's a menu provided for room service, and if you're a business traveler on the go, you can also order sandwiches for take-out. Only the penthouse suites have bathtubs. The bathroom has a nice overhead rain shower head, though, which gives a really relaxing bath experience, so it pretty much makes up for not having one. 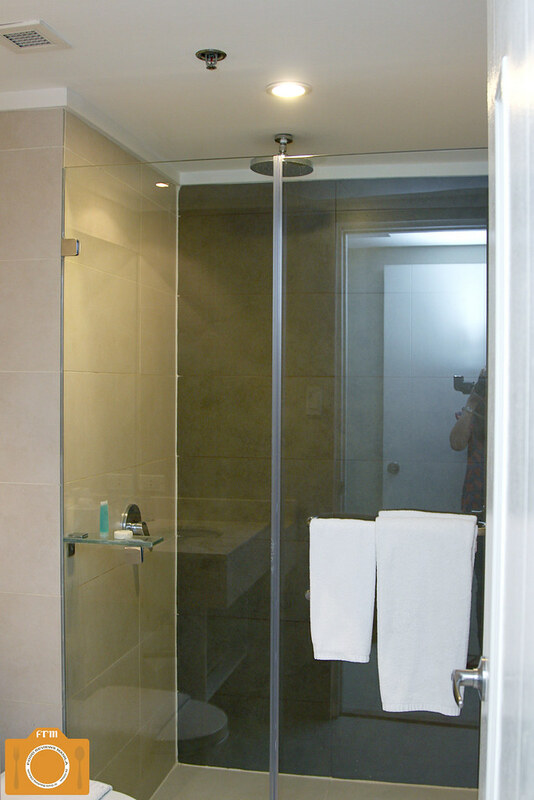 I should get this rain shower for our home. 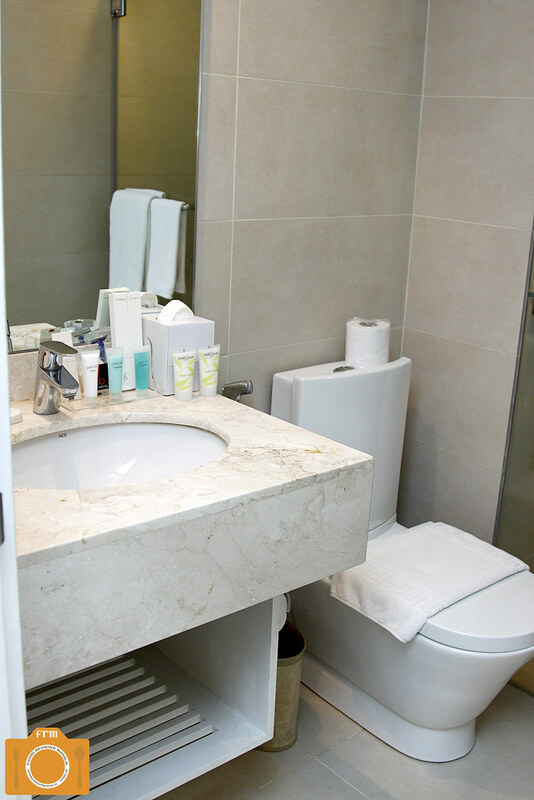 The bathrooms also have a water heating system. Hot or cold? For the toiletries, they have shampoo, conditioner, body lotion, soap, cotton buds, toothbrush that comes with a little Colgate toothpaste, razor, shower cap, facial tissue, and toilet paper. These are replenished daily as well. There are two glasses for rinsing, and if you need more towels, simply call and request. ...and a welcome letter to make you feel right at home. What a warm welcome indeed! Thank you! 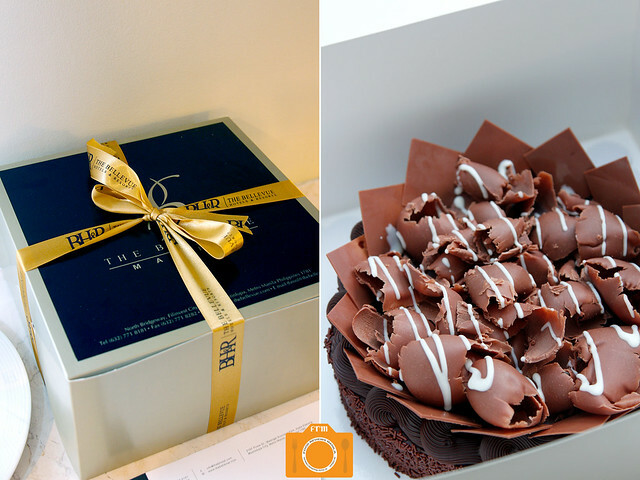 B Hotel has also generously given us this Chocolate Cake (which you can also get from the pastry corner at the hotel lobby). Definitely, one of the best chocolate cakes I've had, and if you know me, I'm very particular about them since I'm usually not fond of pure chocolate anything. It's super moist, with chocolate ganache and chocolate shavings. My baby loved this too, and can't seem to stop herself from eating it; constantly asking for a slice whenever we would get back to our room. 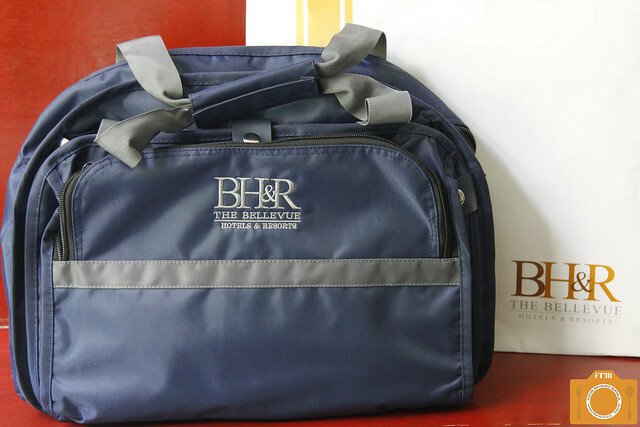 On top of that, they also gave us two travel bags embroidered with The Bellevue Hotels and Resorts logo. Definitely something we could use for future travels and staycations. 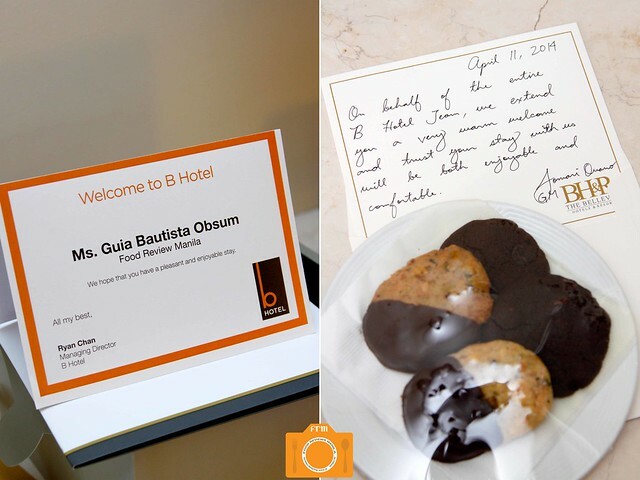 Thank you for the warm welcome, B Hotel Alabang! Kudos to your staff for being so accommodating and approachable. My family and I enjoyed our stay. 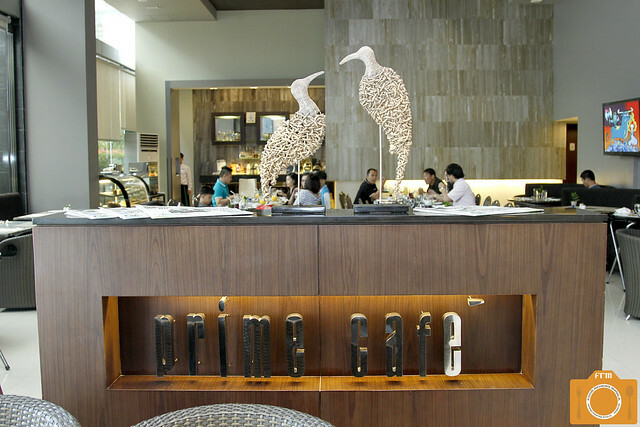 Watch out for my other posts about B Hotel's Prime Café and other food adventures last weekend!